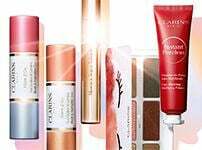 rewards and take home your favourite Clarins best-sellers. Congratulations! You’ve collected enough points to unlock your first reward from us. Choose your favourite treat from this selection, or save them for bigger rewards later. or continue collecting points for an even better selection at the next level. or continue accumulating your points for more exquisite rewards. Be it at home or on the go, these specially curated sets are perfect for pampering yourself. But you can also keep going for bigger, better rewards that we have in store for you! As you can tell, the rewards just keep getting more exciting and enticing. Allow us to pamper you and maintain your youthfulness, or hold on to those points as we have one more reward in store! We do things differently at the top – only the best will do for our Club Clarins Gold members. So go on, indulge in a pampering treatment on us. Let our Beauty Therapists gently massage your skin to work in a wealth of high-performance skin care benefits using our professional formulas. With the purest, most concentrated plant extracts, every Clarins Skin Spa treatment will leave you looking and feeling renewed. Just think of it as our way of saying thank you for believing in Clarins.